Sparkly journals showed up on my doorstep and my heart went BOOM! Earlier in the week my 6 year old lost her second tooth. She’d been wiggling it for weeks and then her sister tripped and knocked the little sucker out. (The tooth, not Lydia!) She came running to me with a grinning bloody mouth. We cleaned her up and washed off the tooth, she pulled out her little tooth box, and I put it up high so no one would touch it until bedtime. All day long she hemmed and hawed on what to write to the tooth fairy. She wanted to leave a note but couldn’t figure out what to say. Hope you are getting pretty teeth! Could I please have another golden doller? I’v alwaz wished to have a jornol of my own that I cold draw all the fairies in. I bet your pixedust will glitter as you fly around the room. She tucked the tooth box and note under her pillow and went to sleep. I tiptoed into the room with the golden dollar and a stack of towels that I could claim to be putting away if I got caught in action. I thought I made a smooth transition but as I was leaving I heard a cough and when I closed the door I heard movement. Drats! A little while later I came back in with the same towels to put them away (read: check and see who was moving around) and I found her big brother (who is 8) with eyes squeezed tight. I know he’s at the point where he’s figured it out, but he also hasn’t quite let go of believing. I’m okay with that. I tucked him back in and said goodnight. I couldn’t resist taking one more look in on them before I went to bed. And since he was asleep, I couldn’t stop myself from tossing around a little pixie dust (gold glitter that I had in my craft supplies) to hopefully help him keep the magic alive a little longer. She squealed with delight over the gold dollar and the pixie dust – some even stuck to her very own cheek! – and rushed into my bedroom the next morning but wondered where the journal could be. We decided that journals were too heavy for such a tiny fairy to lug around. Then today I opened the front door and on my doorstep was a box addressed to my girl. It rattled a bit and I read the return address: Opal the Fairy. Opal the Fairy happens to live in the same city – the same house actually – as one of my friends I met online several years ago. She has the kindest spirit and the most beautiful family. There were journals, pens, and a note…as well as a giant smile in my girl’s face. She read the note aloud to us. I am a fairy. 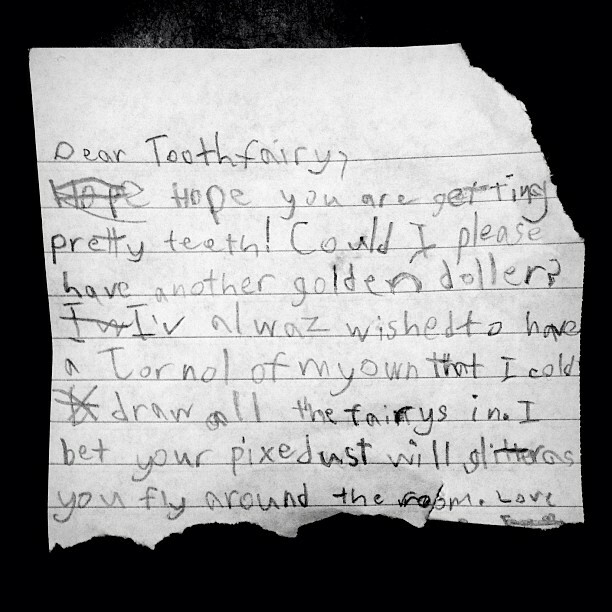 I live next door to the Tooth Fairy (she is my best friend)! This morning we were having tea and cookies together. She told me about the letter you left her with you tooth. Guess what? I collect journals! Keep the fairies in your heart forever. You will always been in mine! And then I had to blink away the tears. I hope they always will be for her, because they are for me. But now instead of little flying pixies, it’s internet fairies who send gifts to my children and angels who hold the door when I’m struggling to get all the kids inside or who stop and smile at me when I have multiple children melting down in the grocery store check out line. 12 Responses to Sparkly journals showed up on my doorstep and my heart went BOOM! How sweet! Yay for awesome friends! Oh so exciting! I hope she fills that journal up with fairy stories! I believe! (I clapped – did you hear me?) What a great fairy to send the journals and note. Now I am teary-eyed! and a great name for a fairy! Gotta love Opal! She is certainly a very special fairy!!! That is the SWEETEST things I have read in a long time!!!! Made me teary eyed, too! I loooove this. So much.